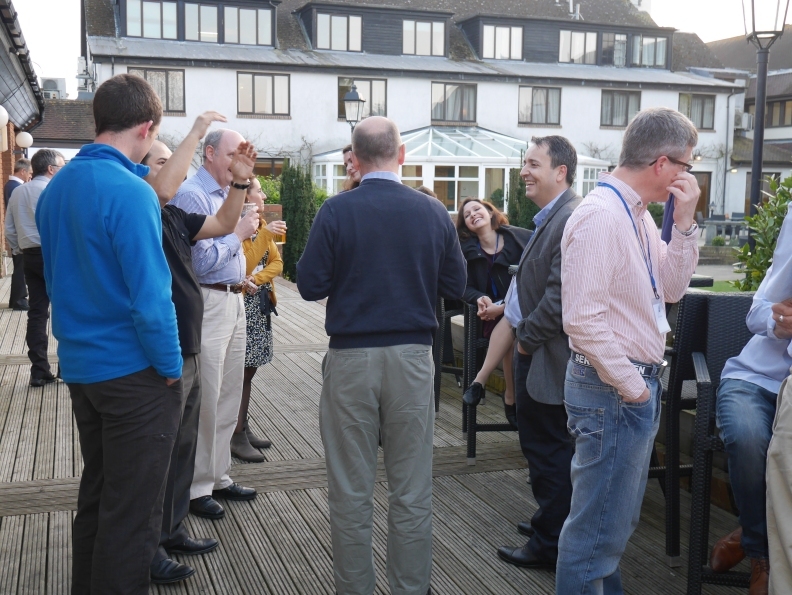 The April 2015 meeting was held at The Oxford Belfry. Young Engineer Sponsorship: The ARMMS RF & Microwave Society offers sponsorship to young engineers (28 or below) who have papers accepted for presentation. Sponsorship is £100 cash plus free attendance (including conference dinner and overnight accommodation). This offer is limited to a maximum of 2 places per meeting. The sponsoired engineers at this meeting were Colin Viegas of Manchester University and Joseph Williams of Filtronic Broadband. 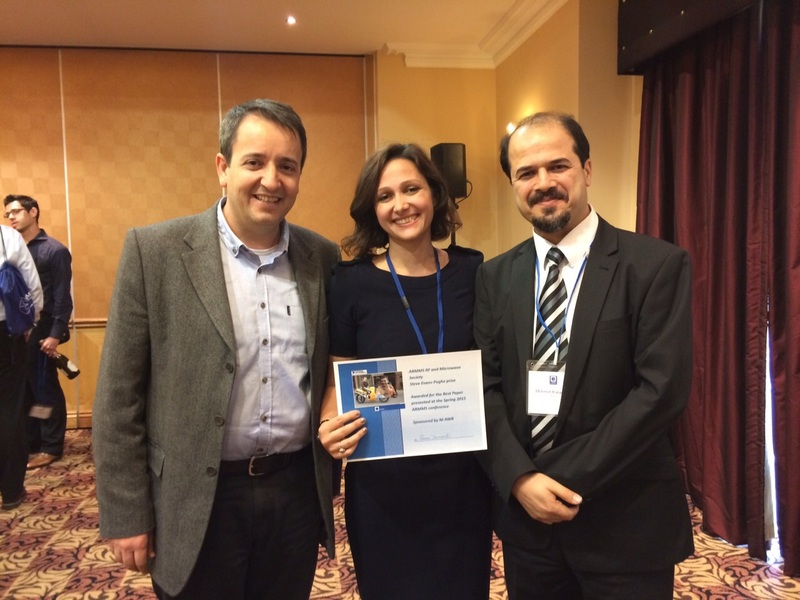 Best Paper Award: Sema Dumanli was the winner of the Steve Evans-Pughe prize awarded to the best presenter as voted by the delegates at the meeting. The runner-up was Christopher Marki. The prize is sponsored by AWR. This paper describes the design and measurement of a PHEMT MMIC medium power amplifier, designed on 2mil thick GaAs substrate for operation at 100GHz. The unconditionally stable design has over 20dB gain and has saturated output powers in excess of 15dBm at 100GHz whilst using a 4V bias supply. The paper will discuss the design methodology and the limits that GaAs MMIC designers are increasingly facing as higher frequency designs become more common and will in particular focus on the trade-off between power and gain as the devices approach their operational limits. 5G communications promises to offer the user the perception of near infinite capacity. This requires a step change in data rates and will be facilitated by a move to higher transmission frequencies where wider bandwidths are more readily available. New innovative mmwave 5G components will be required to meet this demand; this paper describes a 4-channel 28GHz phase adjustable Power Amplifier (PA) IC for 5G front-ends. It offers a compact means of providing beam steering as an integral part of the PA. Each channel of the IC includes a PA with an integral 4-bit, digitally controlled phase shifter. The output power capability of each channel is +30dBm (at 1dB compression) with an IP3 of +38dBm. The phase shifter includes TTL compatible control and has an rms phase error of 2.3°. In this article, we discuss MMIC mixers designed using high performance GaAs Schottky diodes. As opposed to fixed Schottky diode options already on the market, we describe, for the first time, GaAs diodes with forward voltages ranging from 0.25 V to 0.9 V. These diodes enable new circuit capabilities previously not possible in GaAs diode circuits. A state of the art MMIC mixer is developed and exciting new performance characteristics are demonstrated including low LO drive for power sensitive applications and high LO drive for high linearity applications. The First directive on “Physical Agents” (Electromagnetic fields) was published in April 2004 with a transposition date of April 2008. Its publication resulted in a major lobbying effort from “interested parties” with the transposition date being amended to April 2012 and then extended without a firm date being set. In June 2013 the latest version of the directive was published with a transposition date of 1st July 2016. It would appear that this latest directive takes into account the concerns of all “interested parties” and, hopefully, will not be postponed further. Therefore from the middle of 2016 it will become law for employers to ensure employees are protected from electromagnetic fields. Whilst the majority of ARMMS attendees will already have a good understanding of EMF and steps need to be taken protect ourselves from potentially harmful effects, this new directive gives a wide range employers the responsibility of dealing with situation that, when viewed in basic RF/Microwave terms, is as complex as any. This paper explores the subject in more detail. Antenna design for wearable technologies is a challenging task due to the body being in the near-field of the antenna, the highly dynamic nature of the channel and the user acceptance issues. The antenna should be insensitive to the near field effects of the body in order to keep its efficiency high which translates to longer battery life time and to minimize the detuning. Preferably, it could have a reconfigurable gain pattern to satisfy almost contradictory requirements of different links and to cope with the dynamic channel conditions. Finally the antenna should be either small or flexible for the user’s satisfaction while keeping the SAR levels low for safety. This paper discusses the aforementioned requirements in detail and proposes antennas tackling these challenges. Generating frequency sweeps in the S-Band can be achieved in a number of ways. However, achieving the performance requirements of modern communication systems with tight tolerances on frequency, timing and amplitude across temperature and batch variation is seldom easy. For mm-wave radar applications, integrating the antenna element with active components on a single chip, occupies more die area and increases the cost of manufacturing. In an array application, required spacing between the neighboring antennas also causes to employ much larger chip area to handle overall system on a single chip. In this paper, we propose to embed the on-chip LNA/active phase shifter component on the PCB board to combine with the designed microstrip patch antenna and decrease the cost of fabrication. The antenna and passive components are implemented on 130um thick RO3003 board with Er= 3 at 77GHz, while the on-chip LNA/phase shifter is manufactured on 11.4um height silicon dioxide located on silicon substrate manufactured by IHP 0.25 um SiGe BiCMOS process. The circuit is a preliminary prototype to examine the effect of wire bonding and mm-wave on PCB board for applying multiple antenna/phase shifter circuits in a beam-steering array. Simulation and some measurement results of the integrated PCB board will be presented. This paper describes the measurement and optimisation of Schottky varactor frequency multipliers at 80 and 160 GHz. An automated frequency multiplier test bench was implemented using the National Instruments LabVIEW program. The test bench is fully automated with a frequency synthesizer, power meters and bias supplies all controlled using the common SCPI commands via a GPIB interface. This system has been implemented and tested on a range of frequency multipliers with the aim of enabling greater understanding of the performance of these devices than would be possible using manually controlled measurements. The system is being used as a tool to experimentally validate a thermal model for waveguide based frequency multipliers. Initial thermal simulation results will also be presented. Automotive Radar has been available for around twenty years. This paper focusses on the evolution of mm-wave systems operating around 70-80GHz from early Gunn diode systems, through GaAs MMIC based systems, to recent developments in High Frequency Si. In this time Automotive Radar has gone from exclusivity to a high end option, but will moving to silicon finally make it commonplace? Scanning Microwave Microscopy (SMM) is considered as one of the most promising techniques for characterizing samples down to the nanoscale and for quantitative determination of dielectric properties. The microscope works through near-field interaction of microwaves with the sample under analysis; the rapid decay of the field at the end of a sharp emitter ensures that the interaction is extremely localized and the resolution of the microscope is exceptionally high (nanometric scale). Usually the energy transferred to samples is negligible so that the SMM is usually considered as a non-destructive technique. In this work, a COMSOL multiphysics© simulation of a Scanning Tunneling Microscope (STM)-aided SMM is presented. In particular, the joint electromagnetic and heating transfer simulations are performed. The different thermal behavior of two typical samples (HOPG and SiO2) is shown, after a 5 minutes exposure to the microwave radiation. The results demonstrate that the maximum thermal gradient on the samples under study is below 2 degrees, even with an input power of 1W (6 order of magnitude higher than the typical power in use), making the technique suitable for non-destructive analyses. Furthermore, the multiphysics model can be efficiently applied to the understanding of etching phenomena occurred during SMM applications on non-conventional samples, already reported in past works. A practical approach is discussed of how to design relatively broadband RF power amplifier for maximum possible power and efficiency. A non-linear transistor model is used in Microwave Office to extract by Load-Pull simulations the fundamental and harmonics impedances. Then Amplifier Design Wizard is used for the synthesis of real-world matching networks which provide simultaneous control of the impedances at the fundamental and the harmonics frequencies. Microwave Office is used again for accurate final simulations of the synthesised networks and the full amplifier stage. A passive Ka-Band waveguide power splitter is described, which is used as the Input and Output network for a Communication Satellite Multiport Amplifier. The structure was modelled using High Frequency Simulation Software for an 8x8 configuration. This was manufactured using high speed machining techniques, and the resulting hardware electrically tested in a passive INET+ONET configuration. A high degree of correlation was found between the measured and simulation results. During a typical new product introduction (NPI) the design engineering team provides significant support to the production team. This supporting role is critical in allowing the business to meet the short-term goals of “getting products out of door” but, crucially, prevents engineers from returning to R&D activities thereby delaying development of “the next big idea”. To support large-scale production of their family of E-band transceiver modules, Filtronic Broadband have integrated improved Process Flow Management software (FELIX) and new post-test results analysis software (FIDO) into a highly-automated test system (ATE). These combined software systems perform the production-support role traditionally filled by the engineer who designed and developed the product (offering advice, determining rework required etc. ), allowing the engineer to focus on R&D. Additionally, work has focussed on providing easy access to data on key performance indicators. Engineers and managers can rapidly access key production and performance data via an online interface. This work shows how effective use of software systems can lead to reduced costs, higher test site availability, improved throughput and better yield. There has been a longstanding opinion in the field of Microwave signal amplification that vacuum electronic devices, in particular helix traveling wave tubes (TWTs), are an obsolete and will be replaced by solid state imminently but yet the technology lives on! This paper hopes to provide the reader with a better insight into how helix TWTs work, the performance enhancements achieved as the technology has matured and the obtainable benefits when utilising the competing solid state technology. The ability of the new generation of Digital to Analog Converter (DAC)s to convert from a digital signal directly into high frequency bands can be seen as a large leap in capability allowing greater system flexibility, reduction in component footprint and power consumption. This paper presents a new high speed, high bandwidth Digital to Analog Converter (DAC) with high sample rate and high output bandwidth which enables the direct conversion of signals to frequencies up to band X. The component features a number of innovative design features which enable the optimization of performance in the different Nyquist zones. These include various output shaping schemes and interface methods. Preliminary results will be presented which show the performance of the circuit at output frequencies greater than 8GHz. The component’s performance can result in highly flexible and waveform agile Radar signal generation systems and also the potential for improving flexibility of future wireless test systems. Companies booking two or more delegate places are able to take part in the commercial exhibition that accompanies the conference. 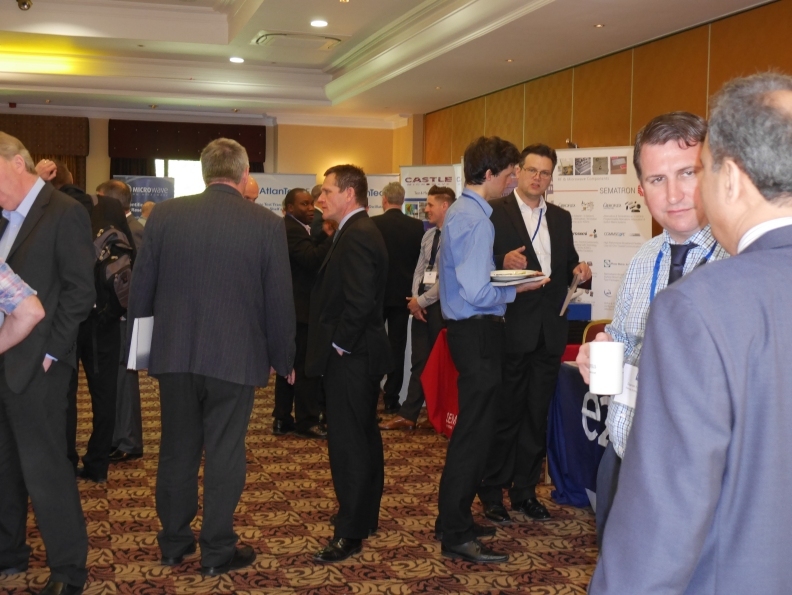 Please note: there is a maximum of 20 exhibition tables at each meeting, these are offered on a first come basis. Booking two delegate places does not guarantee an exhibition spcae, please email exhibition@armms.org to check availability and reserve and exhibition space.